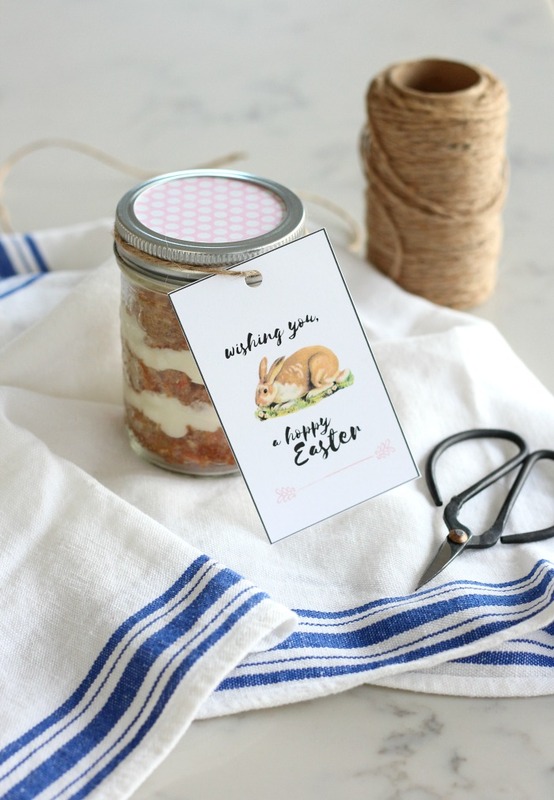 Carrot cake jars are the perfect Easter dessert or gift idea. Who can resist layers of moist carrot cake and scrumptious cream cheese frosting in a cute jar? I was thinking about Easter desserts the other day and decided to make carrot cake with cream cheese frosting. It’s hard to go wrong with carrot cake, isn’t it? Carrot cake is delicious any way you slice it, whether it’s a gorgeous layer cake, bundt cake, simple sheet cake or even cupcakes. I would’ve been happy baking any of these versions, but decided to try out carrot cake jars instead. Let me tell you, I’m so glad I did. 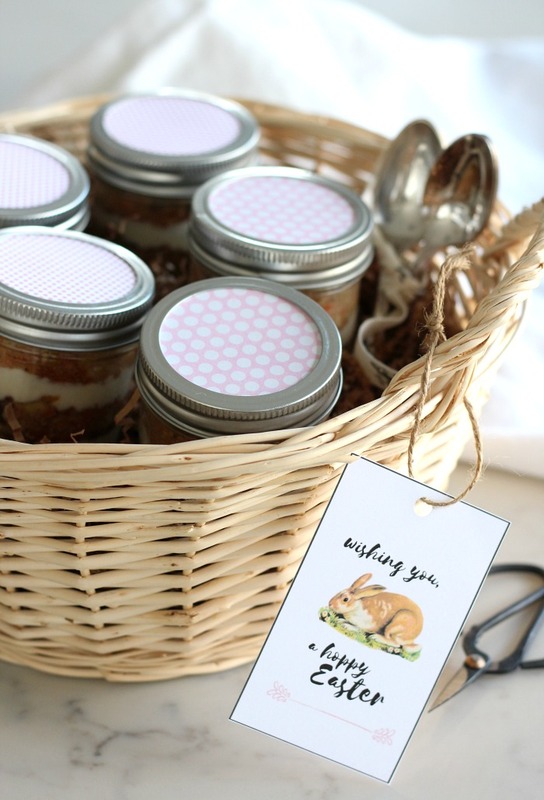 Not only are these carrot cake jars totally scrumptious, they’re super fun too! If you enjoy carrot cake as much as I do, you must try this recipe. The combination of pineapple in addition to the carrots makes this cake super moist. And, the coconut and pecans add the texture I adore so much in a carrot cake. Every bite is SO darn tasty! Of course, the light and fluffy cream cheese frosting is the perfect pairing. A bit sweet, a bit salty… Need I say more? Take a few bites and save the rest for later, or finish the whole dang jar! 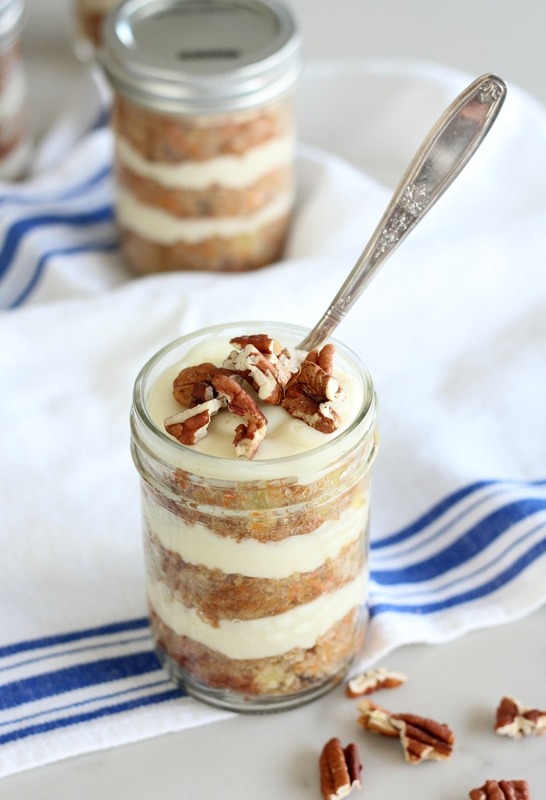 And, why not make these carrot cake jars ahead of time and pop them into the fridge? So handy, whether you’re entertaining Easter guests at home or heading out to a party or picnic. Grab some spoons, et voila! When it’s time for cleanup, just plunk the jars into the dishwasher. Could it get any easier? Looking for an Easter hostess gift or other handmade gift idea? Put together a basket of carrot cake jars. I topped the jar lids with pretty pastel paper before adding them to a basket lined with crinkle paper. 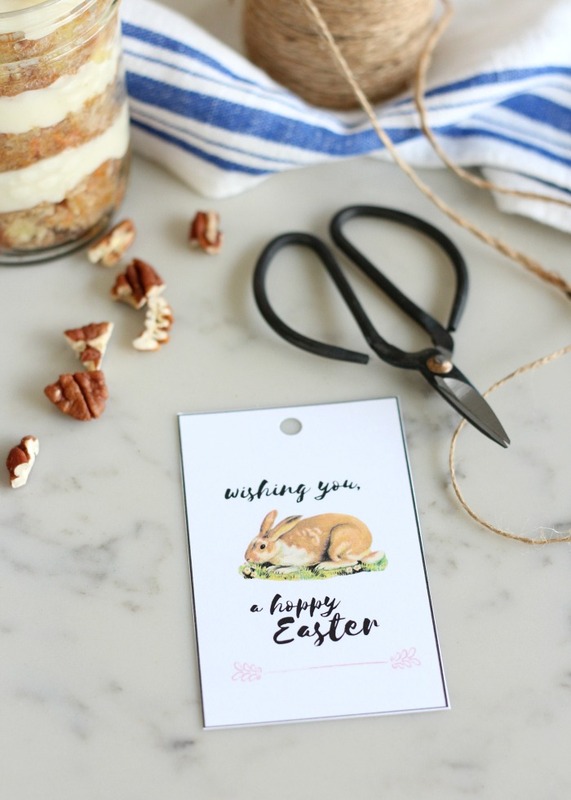 Then, I finished the whole thing off with a printable Easter tag. Fun, right? I definitely won’t be limiting these carrot cakes jars to Easter time only. Wouldn’t they be fun for a spring baby or wedding shower? Birthday parties too! Get your family or friends involved in the assembly part for large crowds. Some links included in the tutorial are affiliates. See my blog polices here. Prepare cake and frosting according to recipe below. Wash and dry 12- 8 oz jars with lids. Using a round biscuit or cookie cutter slightly smaller than your jar diameter, cut out cake rounds (as close together as possible). You can also create your own cutter using a can with the ends removed. Transfer frosting to piping bag with round tip. Layer jars with one cake round, a layer of frosting, another cake round and additional frosting. Repeat one more time or until your jar is almost to the top. You may need to lightly press down cake after each addition or gently tap bottom of jar after adding frosting. Top each jar with toasted pecans (or walnuts). Screw on lid and eat within 2 days, or place in refrigerator for up to 5 days. Can I bake this cake in a 9×13 pan? You can absolutely bake this carrot cake in a regular 9×13 pan if you’re forgoing the jars. Just be sure to grease the bottom and adjust baking time to 40-45 minutes, or until a toothpick in the centre comes out clean. Can I use vegetable oil instead? Yes, you can substitute vegetable oil in place of the melted butter and coconut oil. Can I add raisins? You bet! I’m not a fan, but you can add up to half a cup if you’d like. 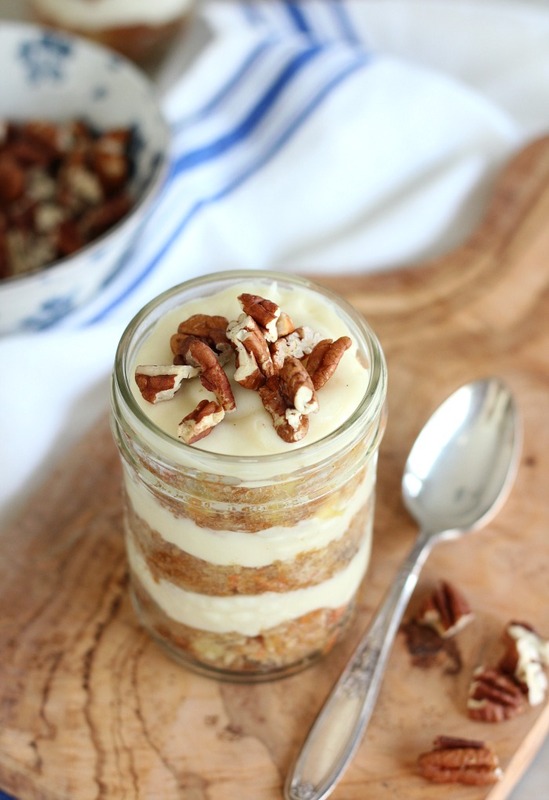 Layers of moist carrot cake and scrumptious cream cheese frosting in a cute jar! Preheat oven to 350°F. Coat a 13x18" sheet pan (half sheet) with nonstick spray and parchment paper. Set aside. In the bowl of your stand mixer with paddle attachment (or hand mixer), mix both sugars, melted butter, melted coconut oil, eggs and vanilla together on medium speed until smooth (about 1 minute). Add cinnamon, cloves, baking soda, baking powder and salt, and continue mixing for 30 seconds, scraping the sides of the bowl as necessary. Mix in both flours until just combined. Fold in carrots, pineapple, coconut and pecans. Pour batter into prepared half sheet pan and bake for 22-25 minutes, or until a toothpick inserted in centre comes out clean. Allow to cool. In the bowl of your stand mixer with paddle attachment (or hand mixer), beat cream cheese and butter together on medium speed until combined. With mixer on low, slowly add the powdered sugar one cup at a time, scraping sides of the bowl as necessary. Once incorporated, turn the speed up to medium and mix for 1-2 minutes until smooth and creamy. Using a round biscuit or cookie cutter slightly smaller than your jar diameter, cut out cake rounds (as close together as possible for less waste). You can also create your own cutter using a can with the ends removed. Screw on lid and consume within 2 days, or place in refrigerator for up to 5 days. Jars can also be popped into the freezer. Can I bake this cake in a 9x13 pan? You can absolutely bake this carrot cake in a regular 9x13 pan if you're forgoing the jars. Just be sure to grease the bottom and adjust baking time to 40-45 minutes, or until a toothpick in the centre comes out clean. Can I use vegetable oil? Yes, you can substitute vegetable oil in place of the melted butter and coconut oil. Can I add raisins? You bet! I'm not a fan, but you can add up to half a cup if you'd like. Looking for other desserts in a jar?